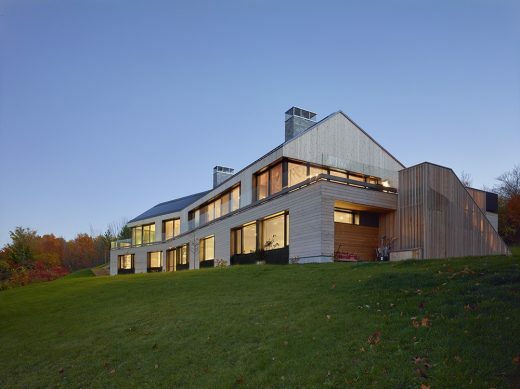 Folding along the ridge of the Niagara Escarpment, this long, linear home is a sensitive response to its landscape, as well as the architectural heritage of the region. The modest, understated exterior belies a comfortable, warm interior that accommodates a young family of five in a sustainable, modern way. 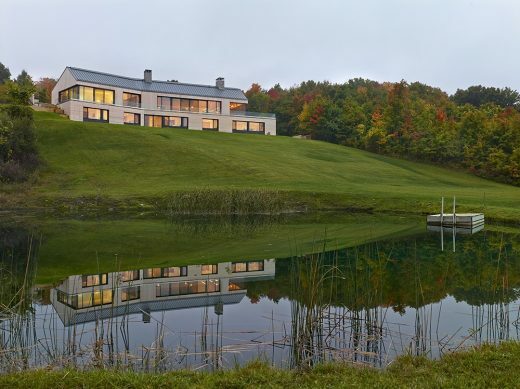 Before commencing construction, the homeowners lived briefly in the existing home on the 100-acre property. Their knowledge of the nuances of the landscape — and the way the sun and wind move across it — was invaluable to the design. 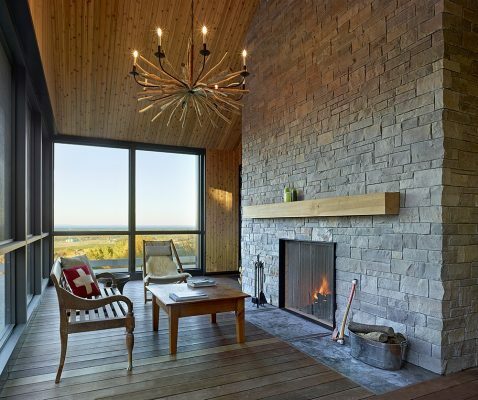 Expansive windows capture arresting views of the surrounding boreal forest and nearby Georgian Bay. 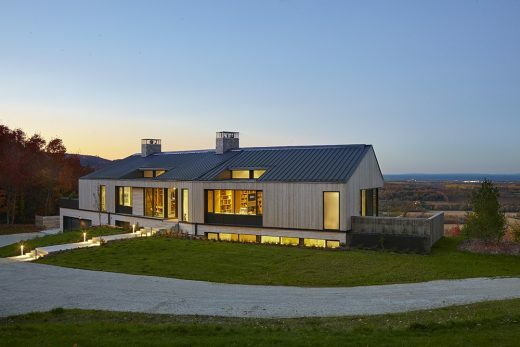 Deeply recessed clerestory windows punctuate the south side of the metal roof, mitigating solar heat gain during the summer, and allowing for passive heating during the colder months. 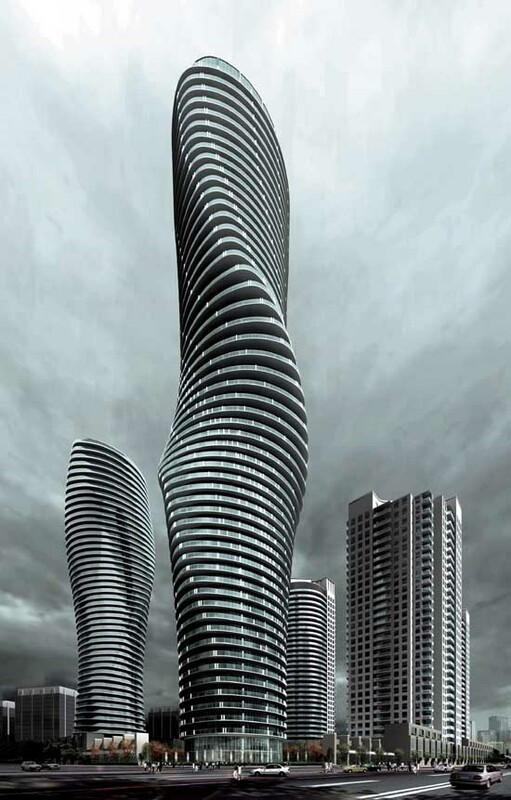 The abundance of natural light and air reduces reliance on artificial lighting and ventilation, while contributing to a heating and cooling strategy that helps to minimize consumption of non-renewable resources. For the massing of the house, the owners wanted an update from their previous, French Provincial–inspired home. 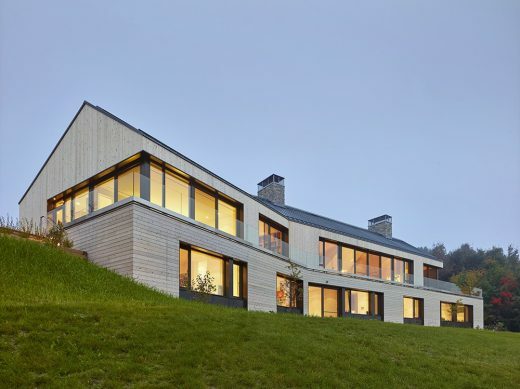 They decided to build something contemporary after experiencing the refined beauty of current-day Swiss buildings. But they also wanted an appropriate iconography for the region and its climate. 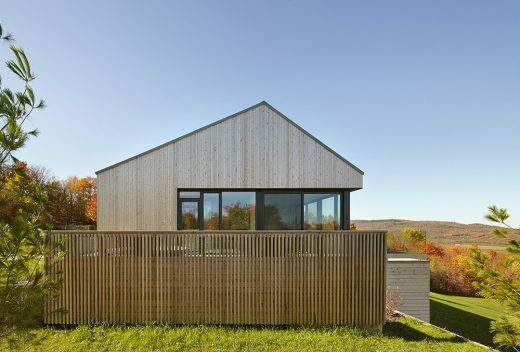 The gabled form was inspired by the Long House, one of the earliest forms of permanent wood structures used in Ontario, which was used by both First Nations and European Settlers to shelter themselves in the harsh winter weather. The home is organized around the central elbow, which bends along a crook in the site. On the ground floor, the west wing houses the main congregation spaces, including the open-concept kitchen, living and dining areas. It also provides convenient access to the vegetable gardens, where the homeowners grow their own produce. The east side was set up for the privacy of the parents. The master bedroom has a secluded den, study and ensuite, as well as a hot tub deck overlooking a flower garden. The central elbow also marks the stair, which cuts down through a light-filled, double-height space into the partially submerged lower level. Downstairs, both children and guests spread out across four bedrooms and two shared en-suite bathrooms. 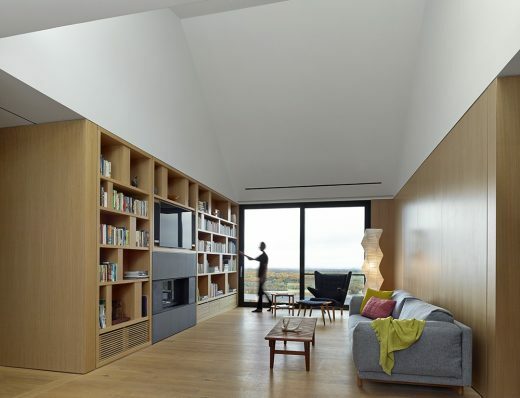 A south-facing recreation room provides further space for congregation. The lower level also walks out to the home’s pond and rolling hills. 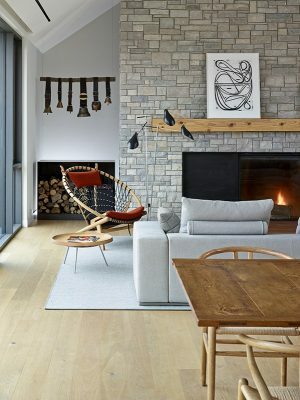 The simplicity of the palette — both interior (white oak floors, white walls, local stone) and exterior (Western red cedar, concrete) — ensures that the design will be timeless, even as the surrounding landscape ceaselessly changes and grows.